How lucky are we that we get to have 3 helpings of cookies in May !! The more cookies the better !! Our Challenge this time is all about graduation and gold.. 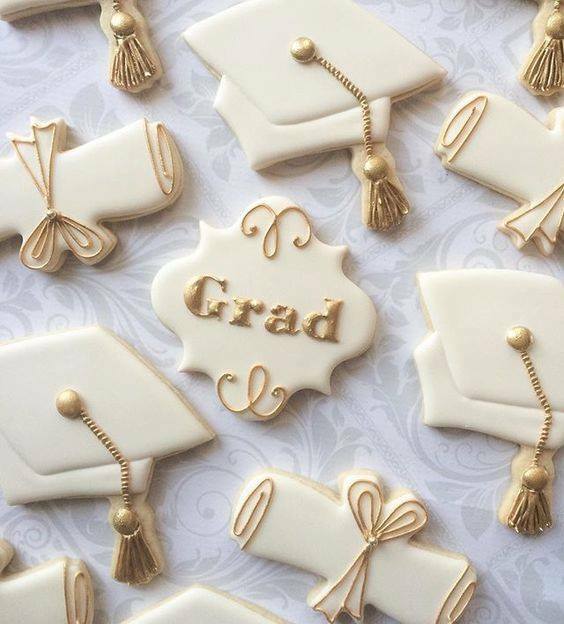 It is that time of year when our children, friends and family members graduate and move on to the next phase in their lives. I did not have any specific graduation stamps but as you all know, that has never stopped a stamper from creating a card!! This is our inspiration picture for the next 2 weeks and our sponsor is Imagine That Digistamp. They will be providing a prize to one lucky person who links up a card . I made my card for a co-worker who recently obtained her BSN while working full time at the hospital and taking care of her family. No small feat !! I made it a bit flowery but also stayed with a simple gold theme for the stamped image. I hope you like it !! 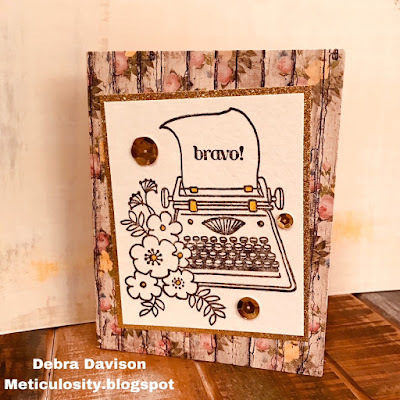 I stamped the typewriter from the Stampendous "Floral Typewriter" set onto a piece of watercolor paper, using Memories India Black Ink. 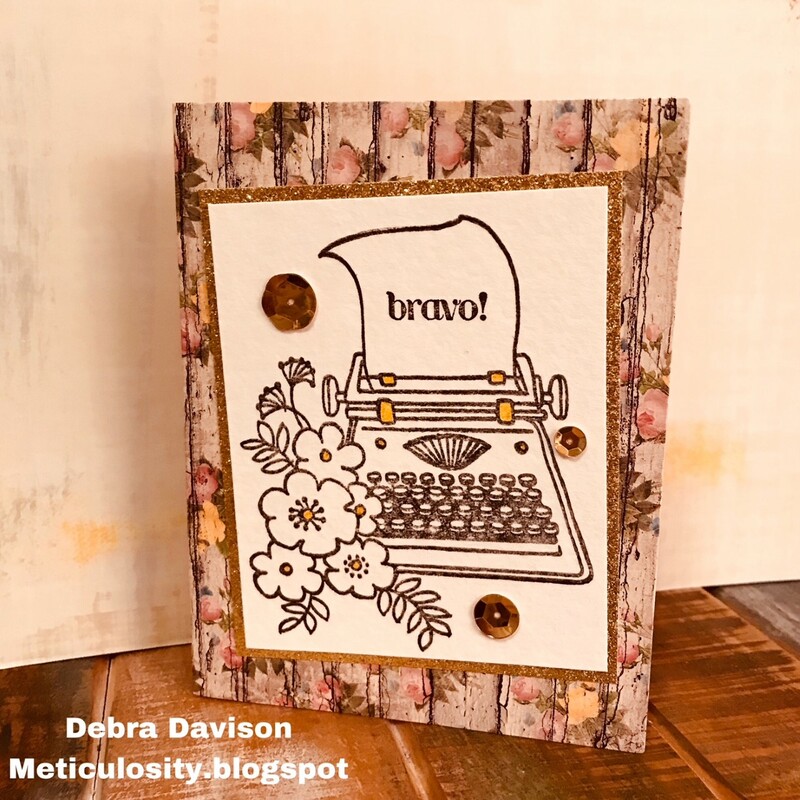 The bravo stamp is by Stampin' Up. I trimmed the image and then matted it with some gold glitter paper, leaving just a small area of the glitter showing around the edges. I adhered the stamped image to a floral wood-designed card base with Tombow adhesive. Using a gold Kaisercraft Glitter gel pen, I highlighted some areas of the typewriter and the flowers. Check out the projects by my teammate's here. And head over to the Imagine That page and look at all of their fantastic digis !! I appreciate you taking the time to visit Meticulosity. Comment on my Coffee Blog Hop posts for a chance to win some blog candy ! !